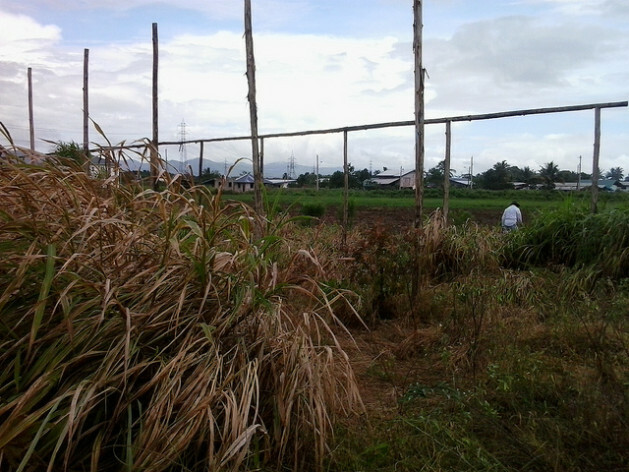 PORT OF SPAIN, Sep 23 2013 (IPS) - Dalchan Singh, a root crop farmer and board member of the Agricultural Society of Trinidad and Tobago, says the past year has seen drastic changes in the weather of this twin-island Caribbean nation. Normally, the rainy season starts in June and continues during the months of July and August, he explained, then eases up until November when the rains start again. Crops grow more slowly when they do not get enough rain at the correct time, he said. Conversely, the heavy, powerful showers the country experienced this year killed some of the crops such as the pigeon peas and caused some of the root crop to rot. Local farmers say the unpredictability of the weather is making it almost impossible to determine what crops can safely be planted when. Climate change is also creating an additional challenge in terms of the pests farmers have to deal with. Khemraj Singh, president of the Felicity Farmers Association in Chaguanas, Trinidad, explains that when there are two or three weeks of steady rain, any attempt to eradicate pests using chemicals is useless since the rain washes away the pesticides. At the same time, said farmer Hudson Mahabir, “there are some positives to climate change” in controlling pests, since “heavy rainfall reduces thrips”, a winged insect that feeds on crops. However, when there is a mix of heavy rainfall and hot sunshine, “it creates the ideal situation for fungus and bacteria to multiply,” he added. Farmers throughout the Caribbean are seeing changes in seasonal weather patterns, which began to become apparent about eight years ago, and now find themselves battling more intense flooding, on the one hand, and dry hot weather, on the other. But strategies exist to minimise these negative effects of climate change. When Ramgopaul Roop started to work his small farm in North Freeport, Trinidad, the soil was very acidic, sterile and compacted. During the rainy season, he had to contend with flooding and during the dry season with the challenge of drought. Roop decided to lime his farm’s soil and increased the amount of organic material in it to improve its fertility. He also made a pond and adjusted the farm’s topography in such a way that during the rainy season the excess water flowed smoothly into the pond, thus preventing flooding; during the dry season, he began using that same water to irrigate. The result is that Roop now makes a good living out of farming. Though Roop’s work in sustainable agriculture began before the impacts of climate change became noticeable, Dr. Humberto Gomez, a technological innovation specialist of the Inter-American Institute for Cooperation on Agriculture (IICA), cites it as an example of what can be accomplished when farmers take a proactive approach to dealing with the problem. “For example, with improved soil and water management practices, such as irrigation and drainage,” he told IPS. “Also, crop varieties can be bred to require less water, complete their cycle faster or slower, to have tolerance to pests and diseases. “Plants could also be bred to use smaller spaces, to absorb and metabolise nutrients more efficiently, etc,” Gomez said. The Climate Change, Agriculture and Food Security (CCAFS) report, “Farming’s Climate-Smart Future: Placing Agriculture at the Heart of Climate-Change Policy”, also suggests growing crops under cover as a useful technology specifically for farmers in the Caribbean. The Trinidad and Tobago government offered to subsidise such technology, known as shade houses, promising to pay half of the cost of building them, according to Khemraj Singh. However, Singh said, those promises were not fulfilled. He said that he began the project of building shade houses to protect his crops. However, such construction is expensive: two and a half acres required 10 shade houses covering roughly 10,000 square feet each, at a total cost of approximately 340,000 dollars. Failure by government to subsidise the construction made the shade houses untenable. “A shade house is a long-term investment,” he said. “I cannot take TT two million dollars and say that the shade houses would make enough money to pay for themselves.” Singh has since abandoned his efforts to implement this technology. He said that local farmers also see the value of drip irrigation and plastic mulching to help cope with local climatic conditions. Among the strategies farmers are using to cope with intense flooding, he said, was the building of many more water channels to ensure that their fields drained properly after heavy rainfalls. Farmers are also building their plant beds smaller and higher to allow for faster runoff of water, he said. The IICA and other regional research organisations are helping by introducing improved germplasm that undergoes testing before it is released for commercial use. Germplasm comprises seeds and genetic material for more resilient crop varieties that can better cope with extreme weather conditions. Unfortunately, Dr. Gomez said, only a fraction of the introduced germplasm makes it to the farms.